The top 5 songs by Iron Maiden on Spotify are “Run to the Hils” (of course! ), “Number of the Beast” (I almost thought it’d be #1), “Fear of the Dark” (huh? ), “The Trooper,” and “Aces High.” I was sort of surprised not to see “Can I Play with Madness” or “Powerslave” in there. 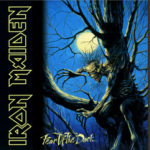 But what’s really weird to me is that I didn’t even know when “Fear of the Dark” came out, or what album it was on, and I don’t think I’d ever heard it until today. It’s the title track of the last album with Bruce Dickinson before he left to go solo for about 4 years.